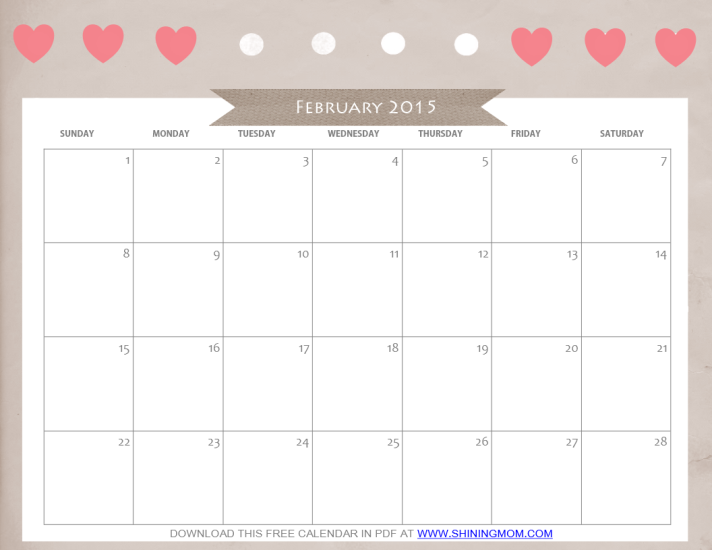 Just in: Cute February 2015 Calendars! I had hours of free time again this morning while the little boy was in school, and as usual, I took the chance to get creative. I don’t know, but when I am in front of my laptop designing anything, I feel relaxed. And since many of you are requesting calendars to use in your homes and offices, I am usually inspired to create them. 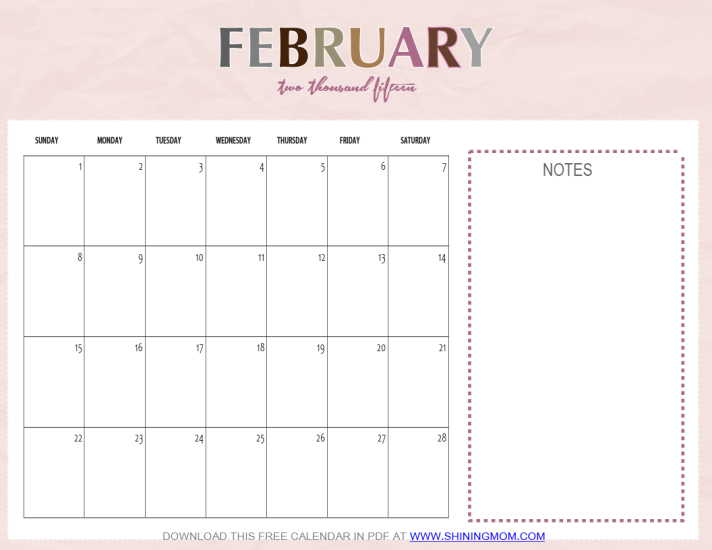 Today on the blog, I am sharing my new creations, my second set of Free Printable February 2015 Calendar. You know how much I love the love month. I have previously released my first calendar set on the blog, and I felt like I wanted to create more with heart embellishments, hence I created another set. For this calendar set, you’ll see shades of gray, pink an brown. I think these colors just blend perfectly! I hope you’ll love the new designs. Here they are! You’ve probably seen this layout in my previous calendar release. What makes this different is the color palette I used. I think it came out nice. What do you think? 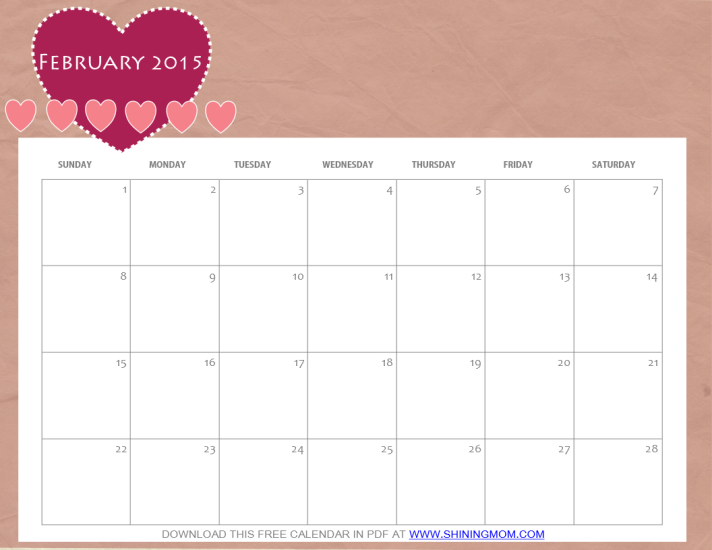 Next in this set is this calendar in pink textured background. I especially created it with an area for you to write down your notes. I’ve been meaning to use different shades of brown in my designs and this is my first attempt. This design came out to be simple and classy. I know the young ones would love to have a cute February calendar to include i their binders for school use. Well I guess your young girl would love to us this one! Print it out for her! Please note that the calendars posted above are for previewing purposes only. (The actual calendar does not have the loong footer displayed! Hurrah!) 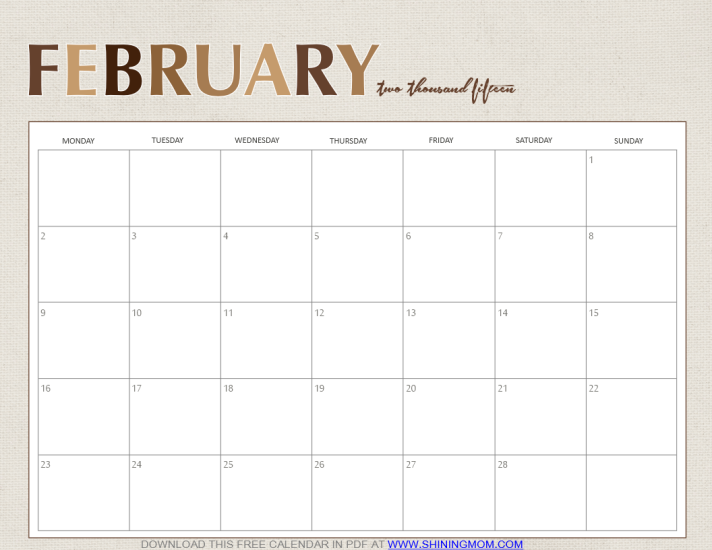 All free printable February 2015 calendars posted here are designed to be printed on a sized 8.5 x 11 paper (in landscape format). Looking for our June 2015 calendars? They’re pretty and free! Get them here. 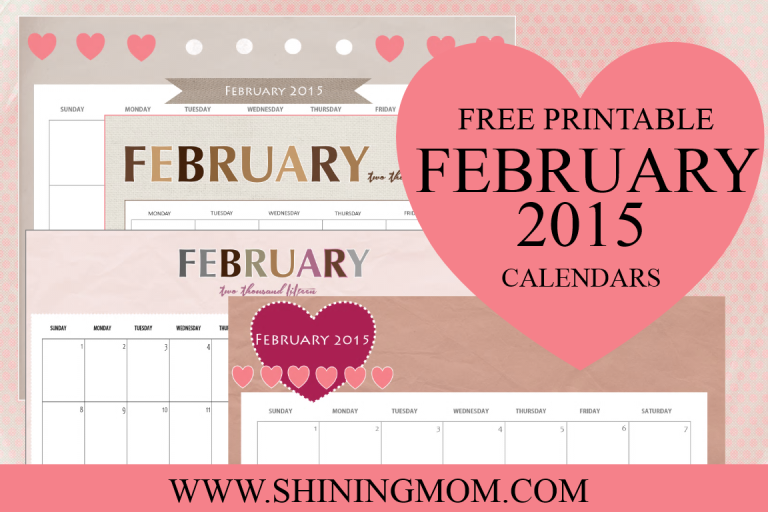 This printable February 2015 calendar set is a © copyright of www.shiningmom.com and is free for personal use . Should you like to feature my work in your blog, please use one image only and, as a courtesy, do not link directly to the PDF download, instead, link back to this post. Thank you!